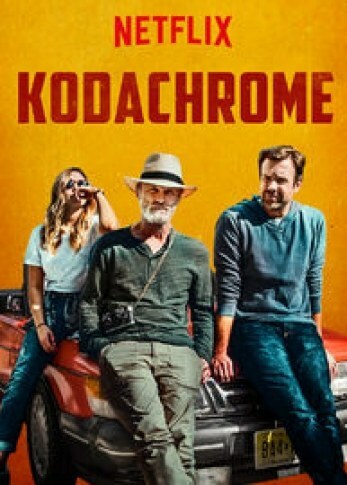 In Netflix’s new Kodachrome, Ed Harris, Jason Sudeikis and Elizabeth Olsen shine in a moving road trip movie about an estranged father and son as they face the fractured images of a broken past to see if there’s something worth salvaging between them, after all. Proving that he can handle dramatic roles as well as carry an entire picture, funnyman Jason Sudeikis is supported with top notch performances by Elizabeth Olsen (Wind River, Avengers) and the magnificent Ed Harris (The Way Back, Apollo 13, The Truman Show, Pollock, The Hours) in the film, Kodachrome which was inspired by a New York Times article a decade ago. Sudeikis is Matt Ryder, a talent agent representing musical bands for a mid-size record label, whose career – in a very Jerry Maguire conceit – comes crashing down when he loses his biggest client. Enter Elizabeth Olsen as Zooey, the nurse and personal assistant to Matt’s legendary photo-journalist father, Ben (Ed Harris), from whom he’s been estranged for over ten years. Turns out Ben is in the last stages of terminal liver cancer. Ben’s dying wish is for Matt to join him on a cross-country road trip to Kansas where the last remaining photo processing lab which develops Kodachrome film is due to shut its doors in one week’s time, signaling the end of an era of photographic quality that many consider to this day to be unrivaled, even as digital photography has virtually replaced that of analog film. Apparently, Ben has recently discovered four undeveloped rolls of film that he doesn’t remember shooting from long ago. Problem is, there’s no love lost between father and son and by all accounts – including his own – Ben has failed his family miserably, for which his son holds a deep-seated grudge and resentment. But Matt reluctantly agrees to the trip, thus embarking on a scenic journey through America’s rural backroads while the trip down memory lane between him and his father is anything but scenic. With a midway stop at Ben’s brother’s home that ends badly, coupled with his rapidly deteriorating physical state, it’s not clear if Ben and Matt will ever repair their father-son bond, something which in Matt’s mind never existed in the first place. Throughout it all, Elizabeth Olsen’s Zooey tries to broker a peace accord between the two men while forging a connection with Matt, all the while struggling with her own personal demons from the past. Time is running out, for Ben, for the film, and for the last hope of any satisfying resolution that will bring some warmth of color to a stark family portrait. Directed by Mark Raso from a screenplay by acclaimed novelist Jonathan Tropper, whose terrific book, This Is Where I Leave You was adapted for the movies a few years back, Kodachrome is an emotionally rich character-driven piece that veers away from schlock sentimentality, opting instead for a good dose of sarcastic and caustic wit wherever possible. So when it gets deep, you feel it in a much more deserved manner than the overt sentimental puppeteering of most family dramas. Raso’s other notable credit is another Norma’s Streaming Pick fave, Copenhagen (reviewed on Jan. 16, 2015) starring Gethin Anthony, who in Kodachrome has a bit part as the lead singer in a rock band that Jason Sudeikis’s character is trying to sign to his label. I found it interesting that both movies end with still images and the ending in Kodachrome in particular hearkens back to the beautiful ending in Cinema Paradiso. The inspiration for the script came from a New York Times article written by A.G. Sulzberger (currently the publisher of the paper) entitled, “For Kodachrome Fans, Road Ends at Photo Lab in Kansas”. In a significant way, Kodachrome is obviously an ode to the film itself and what it represented in the course of recorded human history. But one could argue that the metaphor inherent in Kodachrome seems to be telling us that life is like a roll of film. It requires careful developing to achieve optimal color saturation and high-resolution. Because like the song says, “Everything looks worse in black & white”. Kodachrome is presently streaming on Netflix.